Q Can you deliver to my home / business? A Sorry, we’re the ‘if you can bring it, we can fill it’ guys - not the delivery guys. … but our supplier can! Contact Amerigas at 253 872 7613. Q My tank has expired, can you re-certify it? 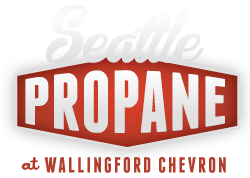 A Propane tanks are stamped with a date of manufacture and must be recertified 12 years from that date. It is against the law for us to refill a tank that has expired – and besides, would you want people going around using a 50 year old tank full of propane? If you have a standard 5 gallon barbeque style, bring it in and we’ll exchange it for a new, certified tank. For other sized tanks, please call Amerigas at 253 872 7613. They can handle all kinds and shapes and sizes and will get you taken care of quickly and inexpensively (most are recertified for under $20). Q Can you help me get parts or service for my system? Q Can you refill the little disposable tanks? A Those little guys that you screw onto a portable barbeque? No. By law no one can. But we can sell you an adaptor hose so you can use regular 5 gallon barbeque style tanks. Come on by and we’ll set you up.